Join Indian Army Registration 2019-2020 | Login Open Bharti Online Form: Join Indian Army through this online registration form for all trades like GD, Clerk, technical, tradesman, nursing, SKT store keeper technical apply online. This is one of the biggest fields in which many candidate wants to make their career. Fill online application form for the Indian army GD, Fill online application for clerk, Indian army online application for GD, clerk and tradesman, nursing assistant, Nursing assistant veterinary. Join Indian Army Registration 2019-2020 or Online application form is availabe at joinindianarmy.nic.in. According to new Bharti rally candidate have to fill the application form for the Bharti Rally. According to the department and as per new government rule candidate have to fill online application for all Indian army Open Bharti Rally . Before 2017 candidate were allowed to appear without the registration and application form, but now Open Bharti Rally pattern has been changed and any candidate without registration will not be allowed to appear for Indian Army Open Rally Bharti. 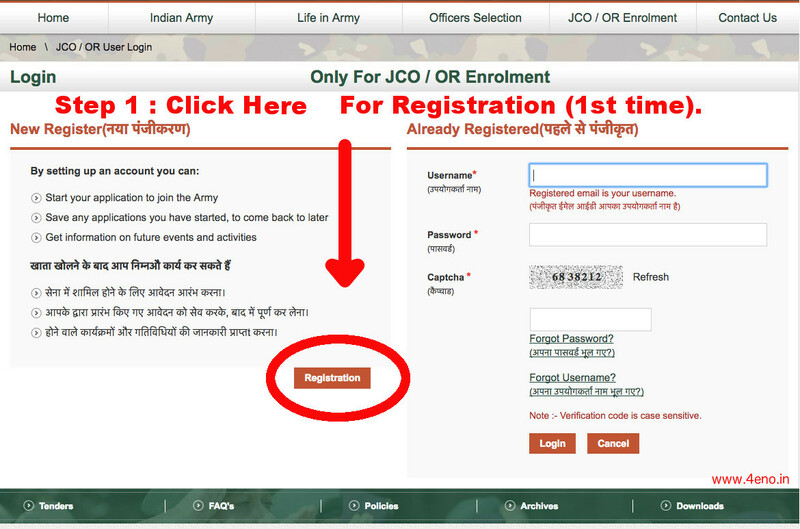 Indian Army Online registration process is mentioned below and the candidate can fill the online form with some easy steps. If you are really crazy about the Indian army then you must fill the application form or registration but if you are doing formalities to show your parents then you should not go for it. If you want any help regarding Indian army registration and get password/ application submission then you may get help from indian army by click on the link below. 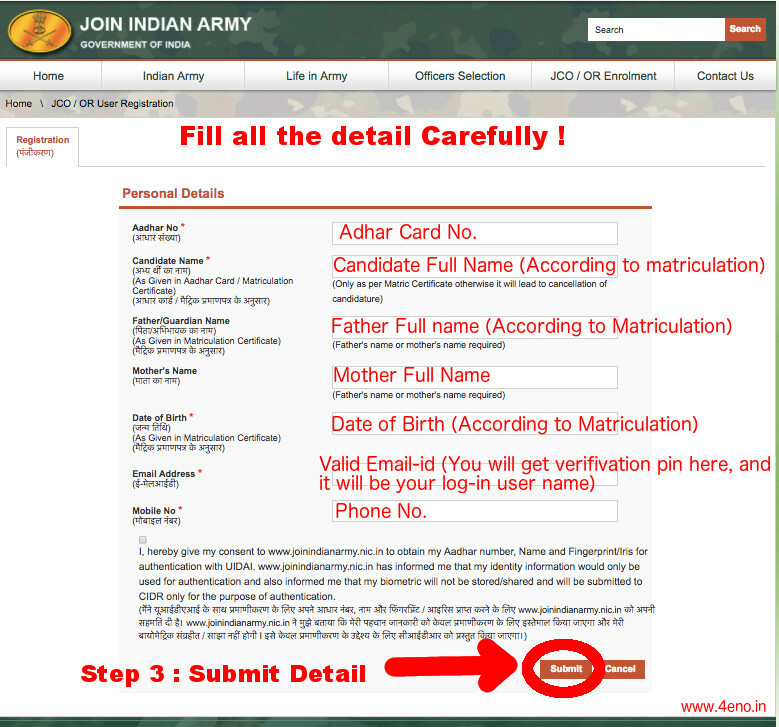 We are describing here steps for theJoin Indian Army Registration/log in and online application form read them carefully and fill online application form or register for Indian army. wrong registration will not be considered. You can Download the admit card after the registration. And without the registration, you will not be allow in the ground. इंडियन आर्मी भर्ती के लिए फॉर्म कैसे भरें या रजिस्टर या लोग इन कैसे करें? उसके बाद अन्य विवरण और अंतिम में ईमेल-आईडी (सही ईमेल ईद भरें यह आपका लोग इन पंजीकृत नाम होगा). Step 1 : Click On the register link If you are not registered before. Step 2 : Read the instruction after clicking on the “registration” and then click on the “Continue” Button. Step 4 : Fill all the details for Registration and press “Submit” button. 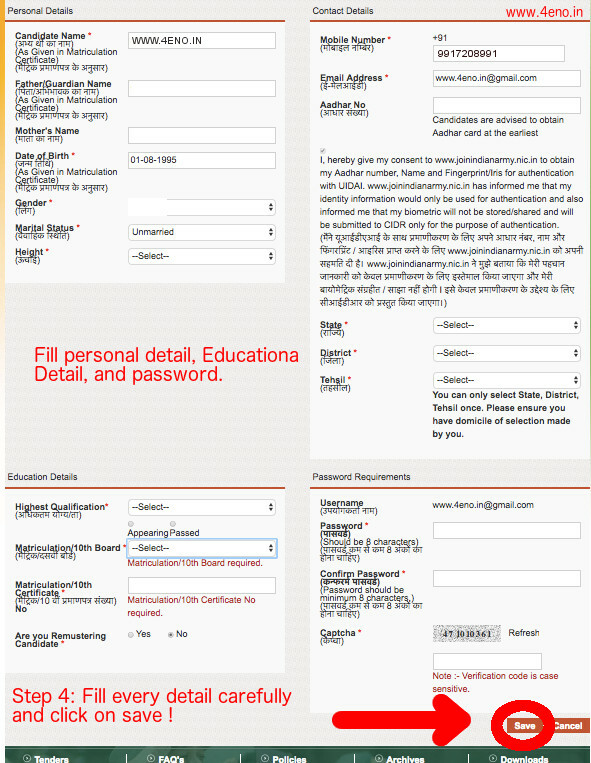 Step 4 : Fill Personal details, Education Detail, State, District. Click On the “SAVE” button. How to update your profile if you are already registered ! You need to follow these steps. You can edit your profile and also can edit information you filled in the Indian army registration. Follow these steps for Edit profile information, like, hight, tehsil, phone no etc. Step 1: Visit the official website of Indian army that is “joinindianarmy.nic.in”. Step 2: Click on the link JCO/ Or Apply Online. Step 4: Fill personal Details, Your Full name (According to class 10th), Your Father name, (According to the class 10th), Mother Name, Date Of Birth (According to the Class 10th), Gender, Marital Status, and height. Step 5: Fill contact Details Your Valid Phone No, Valid Email-ID, Adhar Card no (If available), State name, District Name and Tehsil name. 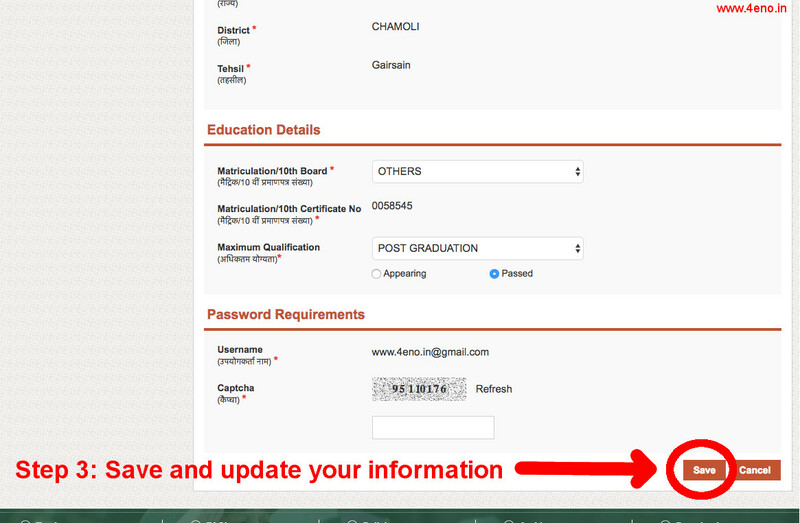 step 6: Then, Fill Education Details like Highest Qualification, Matriculation Board Name, and class 10th Certificate No. Step 7: Fill User name, then set a password, Confirm the password you entered and enter the captcha code. and save it of submit it to the department make sure that you have. There is direct link for Indian army bharti online you may click on that link and feel bharti online application form. Fill online application through the link we have mentioned above. NOTE: In case, if any of you face any problem and any of you have a query then you may leave a comment on our comment box below. we will solve your problem. Hello Nuvozo, If you are interested in Indian army then you may Apply online for upcoming bharti. If I entered my gender as wrong ,how to reset it. Pl help. Hello puttin, you can edit it. Hello Bathini, If you have entered your father name incorrect. Then you can send feed back to indian army. Hello Vishvraj, Visit the official site, Login and edit your information. Hello Surendra, You should Send feedback form to join Indian army. HELLO SIR . I MADE A MISTAKE WHILE FILLING ONLINE APPLICATION FORM FOR SSC(TECH)-51 MEN . THE MISTAKE IS INSTEAD OF PUTTING 750 , I MENSTIONED 800 IN MY OVER ALL MARKS OF B TECH 2,3 YEARS IN 1 AND 2 SEMISTER. Hello Khaja, Visit your profile and edit the information. In case you are not able to edit send feed back to join Indian army. Hello John, We have given setp by step to change or edit your detail in this article- indian army application form correction. Please be more specific towards your query, so we can solve it in a better way. Hello Kirpal, Aap nya email address dalne ki bajay apna email address jan skte ho. aap Indian army ki website par jaiye or wha ja kar forget email-id kriye. fir mobile no se apni email id jaan lijiye. sir i have a problem in here that i create my account on join indian army’s site but i forget that and now when i create new registration that is not possible in there . sir please help me in this situation i also forgeted my email address what i typed in that account of indian army. There was no need of registering yourself again. If you do not remember your registration number then you can also get it from your registered phone number. You must had got a message from join indian army at your registered phone number. I have submitted application form of technical but I can’t get the roll number yet. what’s the problem and I can’t edit my profile now. Hello suhail You should wait for few hours and then try to get roll no. Hello himanshu patel, aap ko indian army me samil hone ke liye kuch maapdandon se gujarna hoga. Uske liye aap puri process ya army eligibility criteria yha check kr skte hain. Fir aap online apply kijiyega. Hello, You need to edit your information by logging to join Indian army profile. Still no response .. I didn’t get the roll number yet ..
Can I cancel the application and re apply again..is that possible?? Hello suhail, You have adhar card verification issue right? Nop .. I didn’t get the roll number ..
Is the roll number will give as time of the admit card?? Hello Suhail, When you will download admit card you can see your roll no. on it. Yes you can edit the incorrect information, just login to your profile after going to the official web portal of Indian Army, and write about your query in feedback/query section. It will be resolved from there. I would like to inform you that I have registered my self for Army Recruitment Rally at Kotdwar (Uttrakhand) and received an admit card for the same. But I have entered my temporary address in place of Permanent address while applying online for this recruitment rally at Kotdwar wef 03 Apr 2018 to 14 Apr 2018. Actually , I belongs to Uttrakhand District Rudraparyag , but presently I am living on Temporary basis at District : Dehradun. And I have filled the Permanent address in the Form as Distt : Dehradun (UK) instead of Distt : Rudraparyaag (UK) . In view of the above , you are requested to confirm me if I can attend this recruitment rally on this admit card basis or not. I have completed my all supporting documents from my native district. But while applying online form , I have wrongly mentioned the district Dehradun instead of district : Rudra Paryaag. Sir, I am very confused that I should go to attend this Rally recruitment or not. So Please confirm me through an email of on my contact mobile Number please if I can attend this recruitment rally on 11 Apr 2018 . I shall be highly grateful to you for this act of kindness. Thanking you . I would suggest you to participate in the rally, but make sure you tell your problem to them, so that they can help you to resolve it. 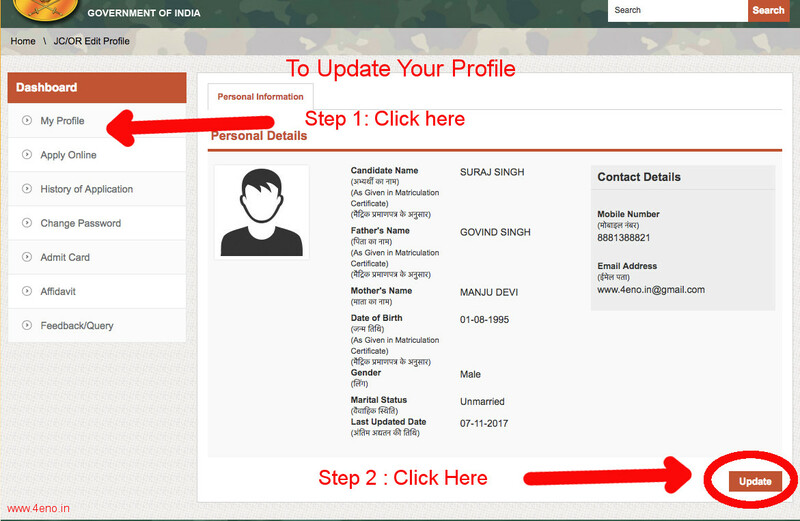 Open your profile by visiting indian army official website and click on query/feedback section and inform them about the changes to be made. Hello Sachin, Can you repeat your question we are sorry to say that we didn’t get your query. I have filled the form for army general duty and the site shows it’s submitted but what’s the procedure after that , will it generate any registration number or any more ? They would had provided you with the registration no. at your registered phone no. or e-mail id. Now save it for future purpose and wait for your admit card to be released. Yes, Abhishek, You will get registration no from their. At the end you should have download a printout of registration submission. You must had got the registration no. and password to your registered phone no. or e-mail id. You can easily recover it from there. Please let us know whatever happens. It is showing verification code is case sensitive again and again after typing correct. Are you sure your code was same ? Try it in another way to do forget password. 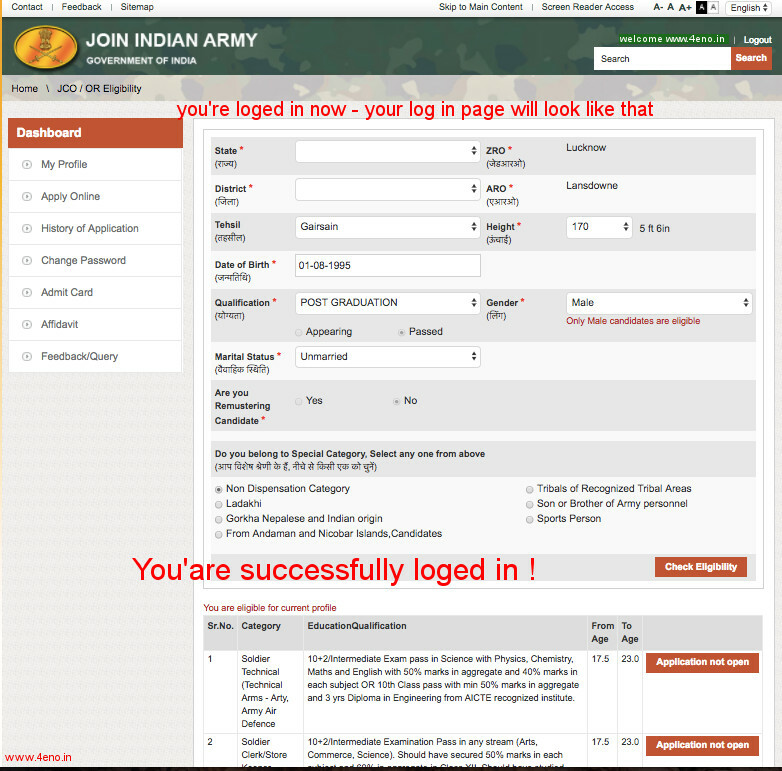 Login to your profile by visiting official page of Indian Army and tell about your query in feedback section, they will resolve the mistake you made. Register yourself again by using a different e-mail id and phone no., let us know if it is filled or not. Hello Vishram, You should retrieve email Id password first or retrieve your mobile no. or ask for re-issue it. Then Only you will be able to access your join Indian army account. Or make another mail -id. Visit your profile that you have created in the official website of Indian Army and go to feedback/query section, inform them about the mistake through that section, they will make changes to it. Have you filled all the details that are asked, firstly check this if you have escaped some details to fill. Register yourself again, using a new number and e-mail id. abhi October me bharti ke form online registration chalu huaa kya..? 17.5 is the minimum age to apply, so you will have to wait. Yes according to your age you are eligible as minimum age to apply is 17.5 years of age, but other eligibility criteria also need to be qualified like you must have scored at least 45% in your 10th. If you are fulfilling these criteria then you can apply. Sir i have got 35 marks in maths… so can i eligible for nursing assistant post..
hello swapnil, You can check the Indian army eligibility criteria and education qualification. sir i resitered in this but it show application not open. why ? hello sakib, aap correction kara dijiye of feedback form bhar dijiye fir. Respected sir, I registered my account in army site. Please suggest me sir how can I apply online army application form. I’m eligible for join army. Hello Trishi Soni, Full information for filling application form is given in this page. When rally will release for your region, you visit your indian army profile and see there are notification for you and then apply online for those posts you are eligible for. Hello Susant, Aap har state ya region ke liye bharti yha dekh sakte hain – Indian army upcoming bharti. Hello Manish, Apne sare documents 10th ke base par taiyar karawo. ya aap apne board se 10th ke certificate me apna name change karawo pahle. You can get all the updates regarding upcoming rallies from our article “Indian Army Bharti Rally 2018”. Hlw sir meri registration hogea lekan sir meri emile ka password vul geya sir plz bataye kye se aply kraugge ..
You can reset your password by clicking on ‘forgot your password’ button, you will be asked some questions that you had chosen as your security questions at the time you made your id, answer all the questions correctly and reset your password. Hello Prabin, Teeth ka checkup aap ek bar kisi dr. se kara lo or unse puch sakte ho ki ye koi major problem to nahi hai. Or aap apply kar sakte ho bina checkup ke ek bar try kar lo then dr will decide. Hello Amit Varma, Aap sure hain ki admit card release ho gye hain, Aap indian army admit card par click karain or fir dekhiye aapke region ke liye admit card issue ho gye hain. agar ho gye hain to thik se login kare or yadi aap download na kar pawo to aap feedback chood sakte ho indian army ko. Hello Ravi, Aap apni indian army ki profile me dekhiye, aapko Update ka option milega wha se aap apni tehsil or state change kar sakte ho. Hello Santosh, Are you sure about that no. you registered the correct phone no. Respected sir, I’m very interested in Indian army but my age is 2yrs over than that given birth date in the form. If there is any possibility of chance pls report me I can do my duty with do or die. Jai Hind. You can apply till the age of 21 years for GD and for other posts like Technical, Clerk/SKT, Nursing Assistant, Tradesman you can apply till the age of 23 years. May i know which rally you applied for?, so that i can provide you with the exact details about the release of admit cards. Sir.my name is amarnath.hight164cm.date of birth 15-07-1995.chest.85cm.B.sc(math)final.kya Mai army me apply Kar sakta ho. Hello SK, Aap apni profile me ja kar no. edit kar sakte ho. Hello Sachin, Aap thik se form fill kijiye or jab net ki speed achhi ho to bhariye aapko jarur option mil jayega. Hello Prakash, Yes you can do registration. hlo sir I am akash sir mai ek baar correction kar chukka hun lekin galtise ek mistek aur ho gayi sir ab mai correction karne ja rha hun toh addhar verification pending dikha rha hai aaj 4 se 5 din ho gaye sir plzz help. Hello Vishal you can apply for Indian army ! Girls can apply in army??????????? Yes girls can apply for Indian Army through CDS after completing their graduation. As your running age is 23 years so you can apply for bharti, but try to apply for bharti before you turn 24, because maximum age to apply is 23 years. Sir, If I am trying to register adhar number already exist coming what should I do. For Soldier GD, the age limit is 17.5 years to 21 years and for other posts its 17.5 years to 23 years of age. Hello sir I want to know Indian army training kha hogi. First stage for Indian Army Open Bharti recruitment is physical examination, if you clarify that stage then you will appear for your written examination. I am mainudeen.I belong to parbatsar in nagaur. When will the Indian army rally bharti to be the nagaur. Sir lakhimpur district kab lagega?? Please hurry up!! m from Assam. Kya main aplly kar Sakta hu ??. Assam regimental centre happy valley Shillong is recruitment main…?? 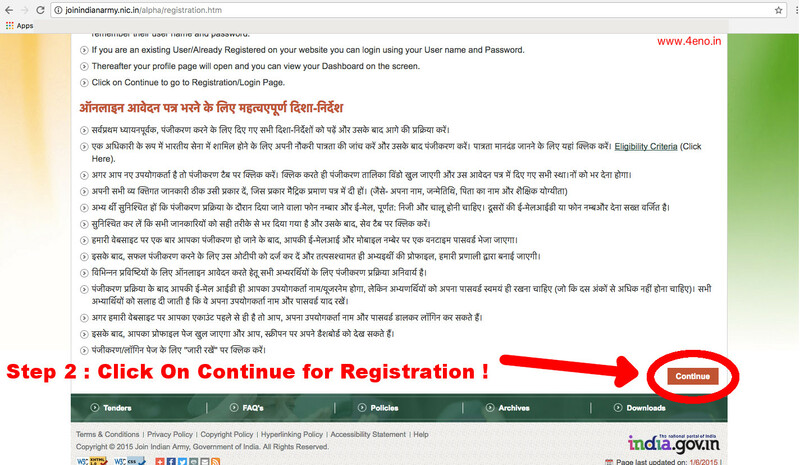 So you have already registered at Indian Army site, therefore it is showing that it is submitted. 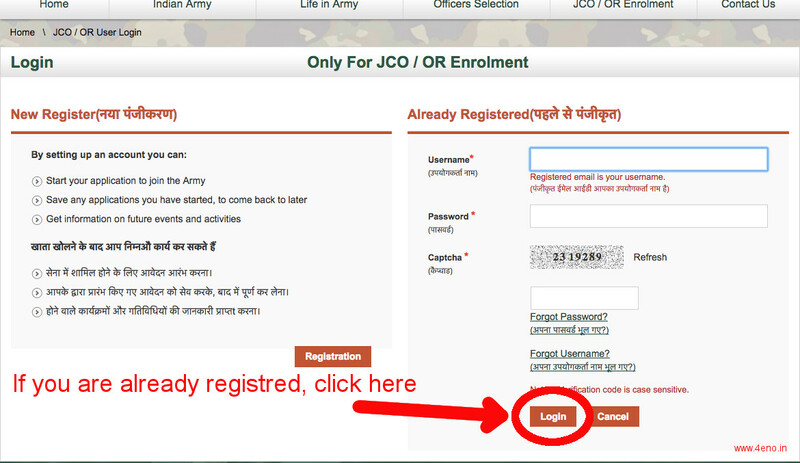 So, now you just have to login to your profile and apply for Army Bharti, you dont have to register again and again. For technical you need to pass your 12th from science stream, so you can either try for GD or tradesman, age limit for GD is 17.5 to 21 years of age and for all other posts including tradesman its 17.5 to 23 years of age. So, according to your age you take decision for yourself, if you have time or fall under 16 to 18 years of age then complete your intermediate otherwise apply for other posts.